There are days when I don’t feel like cooking so we order pizza. Well, that’s because Domino’s is the only food delivery service that is available to my housing area at the moment. Usually my eldest will want cheese pizza while the second one wants bread, the cinnamon one. Occasionally, we also order the add on menu like mozzarella stix or chicken crunchies. So when I saw the promotion for this Fabulous Four today, I thought let’s give it a try. 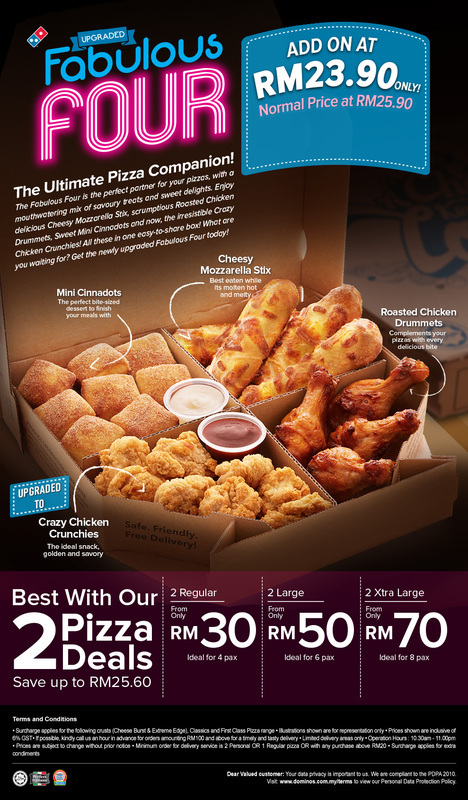 The box comes with 4 add on menu which I’m pretty confident the children will eat at least 3 out of 4 -the cinnadots, chicken crunchies and mozzarella stix. The chicken drummets was not eaten, they tasted it a bit but don’t like it. Sigh, what can I say, the children are really fussy eaters, sob sob! Lucky Dominos far away from my house. Kalau tak mmg dh order. Much prefer Dominos compare the other one.